G'del's Incompleteness Theorems are among the most significant results in the foundations of mathematics. These results have a positive consequence: any system of axioms for mathematics that we recognize as correct can be properly extended by adding as a new axiom a formal statement expressing that the original system is consistent. This suggests that our mathematical knowledge is inexhaustible, an essentially philosophical topic to which Inexhaustibility: A Non- exhaustive Treatment is devoted. Basic material in predicate logic, set theory and recursion theory is presented, leading to a proof of the incompleteness theorems. The inexhaustibility of mathematical knowledge is treated based on the concept of transfinite progressions of theories as conceived by Turing and Feferman. 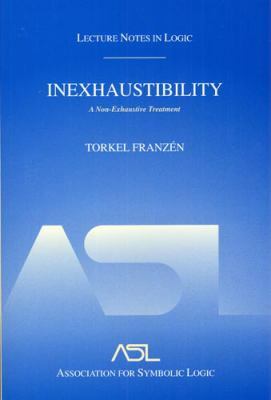 All concepts and results necessary to understand the arguments are introduced as needed, making the presentation self-contained and thorough.Franzen, Torkel is the author of 'Inexhaustibility A Non-Exhaustive Treatment' with ISBN 9781568811758 and ISBN 1568811756. Loading marketplace prices 5 copies from $75.95 How does the rental process work?